Secure and protect valuable equipment in the most demanding work environments. A foldaway keyboard tray, printer shelf, and heavy-capacity lower shelf each roll out for convenient storage. Cabinets have locking double lower doors and an optional hinge-lock bar for added security. Multi-outlet power strip, hideaway flipper doors, and reclosable tie-down strips. Hinged upper door has a viewing window so screen stays protected. 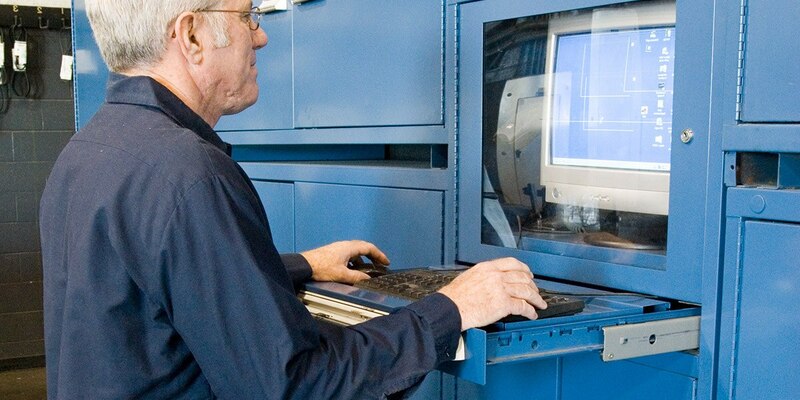 Our computer cabinets are ideal for military shipboards, where durable and organized storage is needed. Store electronics securely with lockable doors and add a hinged-lock bar for added security. 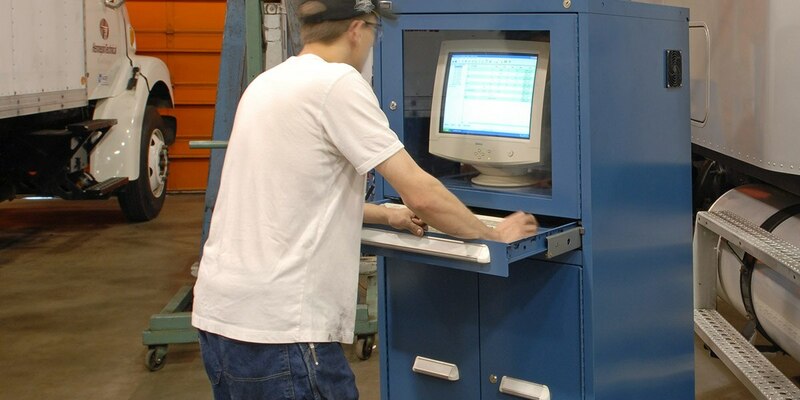 Choose from an array of configurations to house computers safely on the shop floor. Cabinets feature several roll-out shelves, including a heavy-capacity lower shelf that can store electronics or heavy equipment. View descriptions and ordering info for the entire line of Vidmar products, including cabinets, mezzanines, weapons and NC tool storage, workstations, vertical solutions, and much more. Browse our complete line of quick-ship products. Accessories ship in 24-48 hours, and pre-configured cabinets ship in 5-7 business days. Learn the ins and outs of this dynamic pallet-based storage and handling solution, and discover how you can store and retrieve loads faster – regardless of shape, size, or weight. See Vidmar® cabinets in action – built tough to handle any work environment. Discover how this versatile system makes it easy to store and retrieve bulk items. Preview some of the ways our workbenches and workstations can be custom configured. Vidmar® stands behind our products with a limited lifetime warranty. From workbenches and workstations to cabinets and accessories, many of our products ship within a week of your order – so instead of waiting, you're working.